Between the years of 2010 and 2017, there were 963 new single family units added to Hilton Head Island. Source: Town of Hilton Head Island. 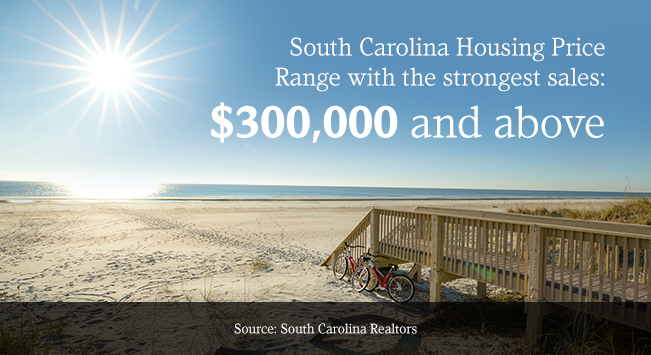 In South Carolina, the Fair Market Rent (FMR) for a two-bedroom apartment is $852. In order to afford this level of rent and utilities — without paying more than 30% of income on housing — a household must earn $2,840 monthly or $34,080 annually. This section includes information related to the number of residential homes, condos and villas sold along with the median price, and the average days on market until sale. This data is organized by town or city for the state of SC. This information is related to the number of properties available for sale in active status at the end of the most recent month. Based on one month of activity. This section includes key market metrics and year-to-date figures, a count of properties that have been newly listed on the market in a given month and of the properties which offers have been accepted in a given month. This section includes key market metrics and year-to-date figures,a count of properties that have been newly listed on the market in a given month and of the properties which offers have been accepted in a given month. This section includes information related to arts and cultural opportunities in Old Town Bluffton and beyond. This section includes information related to dining opportunities in Bluffton and Hilton Head Island. This section includes information related to various arts and cultural opportunities on Hilton Head Island. This section includes information related to the educational opportunities extended from pre-kindergarten students all the way up to higher education. This section includes the South Carolina Annual Report for Housing. The section includes information related to the number of properties available for sale in active status at the end of the most recent month. Based on one month of activity. This section includes information related to the number of Residential Homes, Condos and Villas sold along with the median price, and the average days on market until sale. This data is organized by town or city for the state of South Carolina. This section includes information related to the numerous Festivals in Bluffton and Hilton Head Island held each year. The section includes key market metrics for the current month and year-to-date figures, a count of the properties that have been newly listed on the market in a given month and of the properties which offers have been accepted in a given month. This section includes information related to the number of properties available for sale in active status at the end of the most recent month. Based on one month of activity. This section includes the number of Residential Homes, Condos & Villas Sold along with the median price, and the average days on market until sale. This data is organized by town or city for the state of South Carolina. This section includes information related to the cost of living in the Hilton Head Island Bluffton area. This section includes information related to Bluffton and the recreational opportunities on the May River. This section includes information related to the history of Bluffton. This section includes information related to the history of Hilton Head Island. This section includes data related to the average sales and list prices for homes in the Hilton Head Island/Bluffton area. The community profile has been recently updated (October 4, 2011) by the South Carolina Department of Commerce and the Department of Employment and Workforce. This section provides information regarding relocating to the Hilton Head Island-Bluffton are and the Lowcountry. This section includes information related to the square footage comparison for office commercial, retail commercial, single family units, multi-family units, interval occupancy, manufactured housing, government buildings, hotel and motel rooms, institutional buildings, and vacant acres on Hilton Head Island.